Mouse anti Human CD44v6 antibody, clone VFF-18 (MCA5950) used for the demonstration of CD44v6 expression in human head and neck cancer tissue samples by immunohistochemistry on formalin fixed paraffin embedded specimens. Expression of CD44v6 and EGFR in primary human HNSCC samples. Tumor (T), normal epithelium (E), stroma (S). Dotted lines mark the tumor edge. Representative samples from 7 (CD44v6) or 5 (EGFR) independent tumors. Scale bars indicate 1000 μm (overview) and 100 μm (zoom). 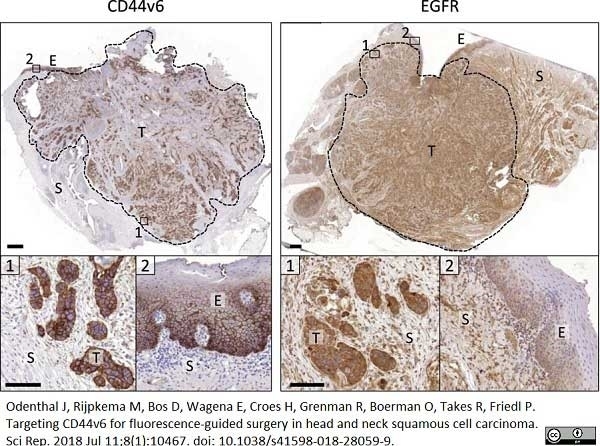 From: Odenthal J, Rijpkema M, Bos D, Wagena E, Croes H, Grenman R, Boerman O, Takes R, Friedl P.
Targeting CD44v6 for fluorescence-guided surgery in head and neck squamous cell carcinoma. Sci Rep. 2018 Jul 11;8(1):10467. Mouse anti Human CD44v6, clone VFF-18, specifically recognizes a centrally located 14mer epitope encoded by amino acid residues 18-31, within variant exon 6 (v6) of human CD44 (Reinisch et al, 1998). CD44 is a member of a polymorphic family of transmembrane glycoproteins, which exists as a broadly expressed ~80-90 kDa standard form (CD44s), and also as numerous splice variants, due to extensive alternative splicing and post-translational modifications. Many functional properties of CD44s have been determined, including cell adhesion, lymphocyte activation, signal transduction, haematopoiesis, recirculation and homing, and CD44v6 has been particularly implicated in leukocyte to endothelial cell attachment and rolling, as well as homing to sites of inflammation and peripheral organs. As well as its role as a receptor for hyaluronic acid (HA), CD44s also interacts with other ligands including matrix metalloproteinases (MMPs), fibronectin and collagens, and has been linked with cancer of the breast, colon, stomach and squamous cell carcinomas (HNSCC) of the head and neck, as well as being a prognostic marker for non-Hodgkin's lymphoma. The variant isoforms of CD44 (CD44v) are highly expressed on epithelial cells but not leukocytes, and their association with cell transformation and cancer is also well established, supported by numerous immunohistochemical studies including those looking at HNSCC. Studies looking at the role of CD44v6 in Crohn's disease, in which clone VFF-18 was generated and characterized, revealed that VFF-18 binds to CD44v6 with high affinity when compared with anti-CD44v6 clone 2F10, and is suitable for detecting CD44v6 in inflammatory bowel disease (IBD) (Reinisch et al. 1998). Mouse anti Human CD44v6, clone VFF-18 is suitable for detecting CD44v6 in inflammatory bowel disease (IBD) (Reinisch et al. 1998). Glutathione S Transferase (GST) fusion protein corresponding to the variable domain v6 of human CD44. Spleen cells from immunized BALB/c mice were fused with cells of the P3X63Ag8.653 myeloma cell line. Storage in frost free freezers is not recommended. 1 This product requires antigen retrieval using heat treatment prior to staining of paraffin sections. Tris/EDTA buffer pH 9.0 or Sodium citrate buffer pH 6.0 is recommended for this purpose. Reinisch, W. et al. (1998) Poor diagnostic value of colonic CD44v6 expression and serum concentrations of its soluble form in the differentiation of ulcerative colitis from Crohn's disease. Foekens, J.A. et al. (1999) Prognostic value of CD44 variant expression in primary breast cancer. Int J Cancer. 84 (3): 209-15. Odenthal, J. et al. (2018) Targeting CD44v6 for fluorescence-guided surgery in head and neck squamous cell carcinoma. Sci Rep. 8 (1): 10467.